Paris Saint-Germain boss Thomas Tuchel says it will be ‘super difficult’ for Neymar to be fit for their Champions League tie against Manchester United next month. The Brazilian superstar suffered a fractured metatarsal against Strasbourg in the French Cup on Wednesday night. 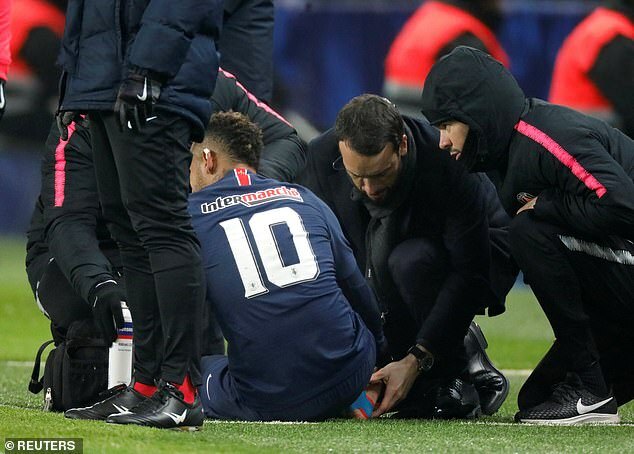 ‘It’s going to be super difficult’, Tuchel told Canal+ when asked if Neymar would return from a metatarsal injury in time for the tie at Old Trafford on February 12. ‘It is still too early to talk about a return date because we need to wait and see how ‘Ney’ reacts to treatment to be more precise,’ he said. Midfielder Verratti is also facing a battle to be fit after suffering a sprained ankle. Despite the absence of the injured Neymar, PSG continued their march towards the Ligue 1 title with a 4-1 home thrashing of Stade Rennais on Sunday. Edinson Cavani struck twice amd Kylian Mbappe and Angel Di Maria also found the back of the net after Mbaye Niang had cancelled out Cavani’s early opener.